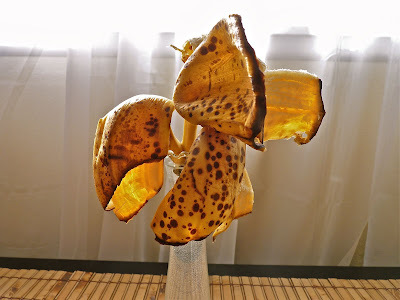 OK, OK, Yesterday's Mystery Flower was a banana peel, actually a lot of them. You see, every morning I eat a half of a banana so I sort of just whack a whole one in half as it hangs from the banana hanger in the kitchen. By the end of the week, I have a bunch of halves hanging from the main stem. I kept them on the stem and peeled them for banana bread, but was sort of fascinated by the group of peels I had in my hand. So, naturally, I stuck them in a vase for you. So, I guess I sort of owe you a flower, don't I? Here is it AND a poem too. Hope you have a terrific Tuesday Betty! No flies on BB...Just on her Banana peel flower. God Betty, I just love that banana peel posey. And the rose isn't bad either. Love George Elliot. Thanks. So you had a good Monday giggle holding all in suspense.I used to save my over ripe bannanas in the freezer for breads, but soon had a frezzer full. I just buy smaller bunches.There are smaller ones, I get those a lot. One small variety to grow was called Ice Cream.You may have the season for it.Nice verse, I could smell the fragrance. So very cool about the banana peels. A VERY creative way to put keep us all on the edge of our seats. Way to go! Just shows that beauty can be found in anything, even old fruit peels! 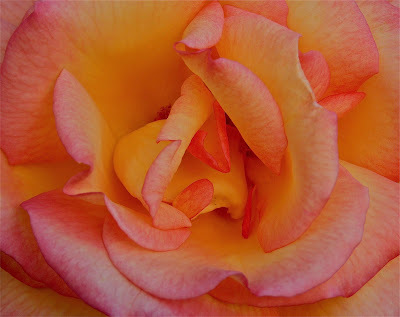 I did not know that poem but as a lover of roses thank you for sharing, it is beautiful. As is your picture of the rose. It's a first, Betty -- and a welcomed one at that. Your creativity and whimsy is inspiring. Hmmmmmm, what happened to the banana bread? A beautiful flower against a white curtain! Well done. It really looked like a flower. See? I was right - dead! So it was banana peel!! I'm glad I aced at least the foodie contest! :D I'm not so sure my Mum will be AS glad with my little achievement though. Sigh. Mothers. And I was going to tell you how your flower looked sort of like a butterfly. Yeah, I thought I was all clever and artsy. You got me! BB LOL and MOL you made MOM chuckle...she said only BB could fool us into thinking it was a flower. Thanks for fessing up you are the Woman....lovely poem too which made up for the smelly banana peel. Yay!!!!! I got the banana bit!! But I never thought you could do that with banana skins so well done you for inventing an amazing centre piece - eat your heart out Martha Stewart, there's a new kid in town and she's FIERCE! I love that banana peel bouquet! Totally unique and cool. But the closeup of the rose is especially photo worthy and the poetry is very fitting. Nice! Betty is forgiven. Heck anyone who can pass off a bunch of old banana peels as a flower deserves to be forgiven. Banana peel flower?! Ha!! It so looked like the rotting flesh plants flower. EWWW! A banana peel? That was slick. That first pic is banana peels? OMG!! You are so creative! You can fool some of the people SOME of the time....but you can't fool good ol' Marlooney ANY time! HA HA. I started growing roses this year, and I really love the poem...so perfect. I actually made rose petal ice cream this weekend. It was delicious! But, sadly, it really didn't taste like roses. The banana peel flower is beautiful and exotic. Thank you for sharing! Just stopping in to say HI....loved the banana flower...very creative. Always enjoy a George Eliot poem. Okay, now I don't feel so stupid! That is so funny! Don't you have gnats from the opened bananas? I bring home a couple of bunches a week and constantly have to drown the gnats in wine. Seriously it works. I just put out a glass and they drink themselves to death. It's the funny little bits of you... like halved banana peels... that I enjoy the most.